Do mar que cantava só p’ra mim. Of the sea that was singing just for me. 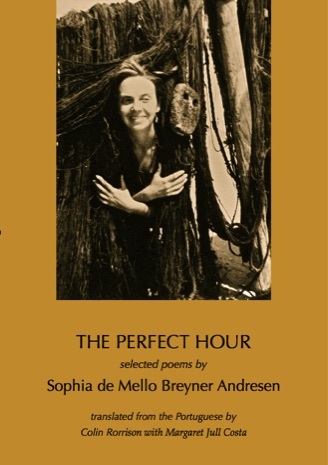 Poet and storyteller Sophia de Mello Breyner Andresen (1919–2004) is one of Portugal’s best-loved writers. Her poems express her deep connection with the natural world, her main subjects being childhood and youth, nature and, above all, the sea. She was also steeped in classical literature, and some of her Greek-inspired poems are present in this selection which features translations from two of her poetry collections –– Dia do Mar and O Nome das Coisas –– translations made by Colin Rorrison before his sudden death in Argentina at the age of 28, and edited by the celebrated translator Margaret Jull Costa. Dia do Mar was published in 1947, when the poet was 28. Its subjects are gardens, the sea, the beach and the house, and its central theme, the search for perfection, purity and harmony. The poems have all the intensity of childhood memories, but are imbued, too, with an adult awareness of mortality. O Nome das Coisas was published thirty years later, after the Carnation Revolution of 1974 and the overthrow of the Salazar/Caetano regime after almost fifty years of repression. Many of its poems are political and refer to a particular time and place and situation, and yet they remain strikingly bracing and fresh. Colin Rorrison was born in Leeds in 1983 and died suddenly on 8th September 2012, at age 28, in Lomas de Zamora, Buenos Aires Province on his first visit to Latin America. He studied Spanish and Portuguese at the University of Edinburgh and also attended university and college in Coimbra in Portugal and in Málaga and Barcelona in Spain. He was widely read in Iberian and Latin American literature and had translated the text of a new film by Bráulio Mantovani, who wrote the screenplay of City of God (Cidade de Deus, 2002). He left behind a substantial body of poetry and prose translations from the Portuguese and Spanish, some of which have been published posthumously. Margaret Jull Costa has been a literary translator for nearly thirty years and has translated novels and short stories by such writers as Eça de Queiroz, Fernando Pessoa, José Saramago, Javier Marías and Bernardo Atxaga. She has won various prizes, including, in 2008, the PEN/Book-of-the-Month Club Prize and the Oxford Weidenfeld Translation Prize for The Maias by Eça de Queiroz, and, most recently, the 2012 Calouste Gulbenkian Translation Prize for The Word Tree by Teolinda Gersão, for which she was also runner-up with her translation of António Lobo Antunes’ The Land at the End of the World (Os cus de Judas). In 2013 she was invited to become a Fellow of the Royal Society of Literature and in 2014 was awarded an OBE for services to literature. The grave voice of indolent dreams. Where Saadi and Hafiz saw and loved them. Chosen and summoned by my desires. Held between leaf and leaf. "A major contribution to the still pressing task of disseminating Sophia's work more widely in English."